Below is a full rush transcript of the press conference by Tri-Lateral Air Force Exercise Point Blank Major General John Wood, 3rd Air Force Commander of the U.S. Air Force Air Commodore , Jez Attridge Joint Force Air Component Commander, UK’s Royal Air Force and Major General Luc de Rancourt , Commandment Air Defense & Air Operations, French Air Force. 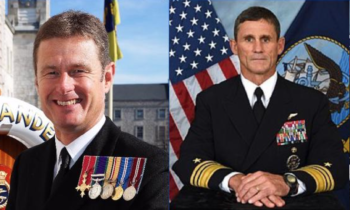 Today, we are very pleased to be joined by Major General John Wood from the U.S. Air Force; Air Commander Jez Attridge from the UK’s Royal Air Force; and Major General Luc de Rancourt from the French Air Force. Tomorrow the Tri-lateral Partnership in Exercise Point Blank will take place in the UK, so this is a very timely discussion. And we thank our speakers for taking the time to speak with us today. Maj. Gen. Wood: I’m happy to talk to you today from the United Kingdom. It’s really pretty exciting. I wish you were here to see what we have in the hangar just right by us. 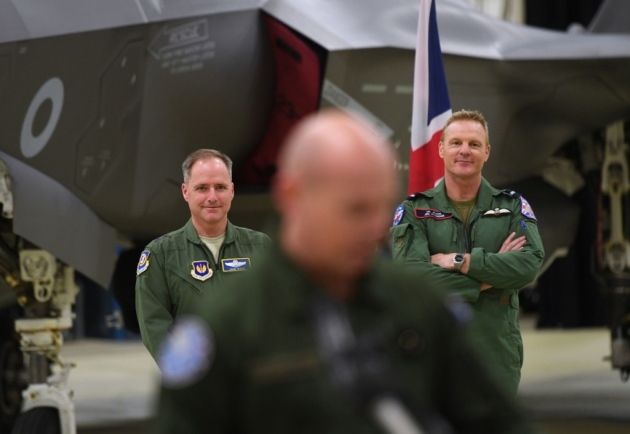 We’re really fortunate that our United Kingdom hosts are here with us, and Air Commodore Attridge, and they’ve got a shiny F-35B right there, and it’s pretty remarkable to look at that. And then for General de Rancourt to have his Rafael right there in our hangar is just awesome to look at, and of course we’ve got our own F-15 there. The point of that is, we’re here in the United Kingdom today with friends. Friends are a great thing to have. We’re really going to focus tomorrow in our exercise on the interoperability capability of our platforms, and that’s really important. What we’ll also see is we’re at a high state of readiness today, but this just takes our readiness to the next level, and that’s certainly a focus from the American side, to make sure we’re interoperable and we’re ready at all times. We’re going to take this 4th generation platform, 5th generation platform, work it together. And there will probably be some learning and that’s always fantastic for us. 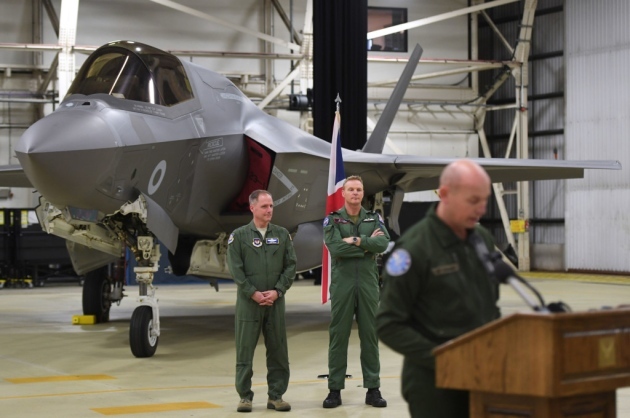 And it’s exciting for us on the American side as we look forward to 2021 when we put 48 F-35s here in the United Kingdom. So that’s an exciting time as well. Maj. Gen. de Rancourt: it’s a very good opportunity and we really thank our friends from the U.S. Air Force and the Royal Air Force to have invited us to participate to the Point Blank Exercise. The proposal was made about four months ago, and which unfolded quite quickly. It shows how the links between our three Air Forces are very tight. We really expect to see that vision being flown tomorrow. We are pretty sure that out of that mission there will be a lot of interesting lessons learned, especially, as was just mentioned, in the interoperability issue, and we need to make sure that any new aircraft coming into service, and I think about the F-35 which has just arrived in the RAF, we need to be able to work together and to keep our very high standard of interoperability in order to be able to fight together and to prepare the future together. Air Comm. Attridge: This is excellent for us because it brings together yet again airmen from our three countries, and we’ve been operating together for many years. This gives us the opportunity now to integrate 5th generation capability into an exercise which brings us to a level where we look at contested operations and how we get the best out of those capabilities. So we look forward from the Royal Air Force for the first time that we’re actually bringing our F-35 Bravos into an exercise such as this. And although it’s the first time for us, we’re building up now to 138 overall over the lifetime of this aircraft, and this is just the beginning for us as we move towards our initial operating capability. So it’s exciting times. I think exercises like Point Blank allow us to stay ready, because if we stay ready, we don’t have to get ready. Maj. Gen. Wood: I’ll just walk though, there are about 50 aircraft that will take part in this. The exercise will focus on the environment, our aircraft and personnel to train together in a real environment, and some of the things we’ll actually focus on directly will be air interdiction, offensive counter-air, personnel recovery and dissimilar air combat maneuvering. Question: This is not the first Point Blank exercise, and previously the 5th generation aircraft participated with the F-22. Now how does the F-35 compare in this exercise, comparing to the F-22. What would be the key differences? Especially for the French and the Royal Air Force ? Air Comm. Attridge: Of course we don’t operate the F-22, but what we do is, we have some experience with the integration with the F-22. And that integration now we’re looking to turn through 180 degrees to bring that capability on the RAF side to cooperate with the 4th generation aircraft here. I think what it gives us the ability to do is uses strength that you see in these well-tested platforms, the Rafael and the Typhoon, to augment the unique capabilities that stealth aircraft can bring, which quick clearly is to deny the enemy awareness of where the airplanes are, et cetera. But it’s really just using all of the sensors, all of the capabilities of that high technology platform, the F-35, to increase the capabilities and the longevity of the other airplanes that are part of the package. Maj. Gen. Wood: I’ll add in from the United States perspective, you’re right, and thanks for the history of that. This is not the first time we’ve done this in terms of the Point Blank exercise itself. We’ve done that for quite some time. But this is the first time that we’ll do it with the French and the 5th generation integration. So that’s really important for us. The really neat thing for us as we do this and go forward is every day and every time that we interact with our allies and our close friends here we get better and we know more about each other. So that’s really, it is not breaking ground, but this is new ground for us to do this with our three countries today. Question: if you could explain to us how this exercise relates to, as we understand it’s not a NATO exercise, but how perhaps you’re coordinating with NATO and how the allies coordinate outside the framework of NATO. Maj. Gen. Wood: So really we are NATO allies, as you said, but this is a locally generated exercise. When I say local, it started here in the United Kingdom with the American and the [UK]. 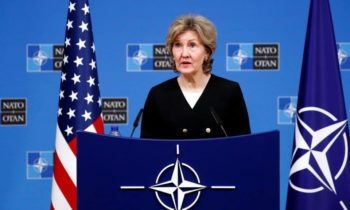 As you well know, we do many of these exercises bilaterally or in this case trilaterally, so I think that would be the tradition that within our alliance we have the capability to do that, and within the alliance we have information-sharing operations. So although the focus can come across that it’s a flying operational exercise, there are a lot of other things that we’re doing together. Some of that is how do you share information, how do you process information, how do you brief, how do you debrief. So we’re doing all that, and that’s at a trilateral level today, not necessarily a NATO-sponsored event. 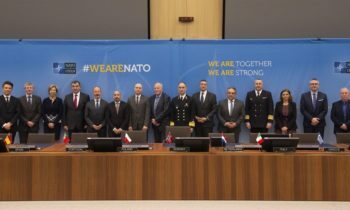 Maj. Gen. de Rancourt: As John just mentioned, we are all three NATO allies, but you also have to keep in mind that a few years ago there was a Trilateral Strategic Initiative which has been signed between our three Chief of Air Staff. That was in 2011, if I remember well. And all those exercises are under the auspices of that Trilateral Strategic Initiative. That’s the reason why now we are so close links between our three Air Forces and that’s very important. Maj. Gen. Wood: We are excited about tomorrow, about the interoperability that we’re going to face, the integration, and the teamwork that we get to do together. So thank you. Air Comm. Attridge: And just on the RAF side, I think we’re just very grateful for the opportunity to train together like this. It’s challenging when we have so many operational commitments, so we need to make the most of all our time. To come here to such a great facility and have so many capabilities brought to bear to the exercise tomorrow. It’s a huge opportunity. Maj. Gen. de Rancourt: My closing remark would be that beyond the interoperability issues and procedures, meaning equipment and so on, I really expect that the personal links that will be established between our crews, between the people who will work together will be very tight, because that’s the key to success in the future operation that we would have to conduct together. Maj. Gen. John M. Wood is Commander, 3rd Air Force, Ramstein Air Base, Germany. 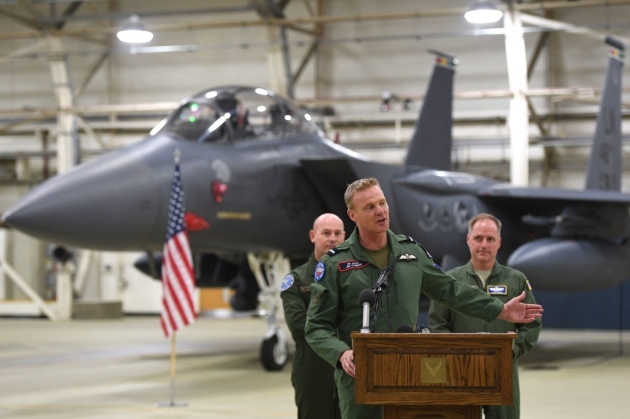 Third Air Force plans, deploys, sustains and redeploys Air Force forces that directly support the combatant commanders during contingency and wartime operations. General Wood oversees a headquarters staff and Airmen located at nine wings in Europe and one air expeditionary wing. General Wood was commissioned in 1989, earning a degree in Aeronautical Engineering from the University of California at Davis. He has commanded an airlift wing, an air base wing and an air refueling squadron. His previous staff positions include tours at the Joint Staff at the Pentagon as well as Headquarters U.S. Transportation Command at Scott Air Force Base, Illinois. As a Chief of Staff of the Air Force Fellow, he worked directly for the Secretary of Transportation advising on department-level strategic initiatives to include the Next Generation National Airspace Initiative. The general completed his senior development education as a RAND Fellow analyzing contemporary Air Force issues, such as C-130 fleet aging. Prior to assuming his current position, he served as the Director of Strategic Plans, Requirements, and Programs at Headquarters Air Mobility Command. General Wood is a command pilot with more than 4,000 flying hours, primarily in the T-38, C-130, KC-10, C-17 and C-21. Jez Attridge Joint Force Air Component Commander, UK’s Royal Air Force – Joined the RAF in 1989. After flying training he was posted to No. 43(F) Sqn, Leuchars, as a pilot on the Tornado F3. He deployed in support of Operation Deny Flight, policing the No Fly Zone over Bosnia and was employed on Quick Reaction Alert duty both in Scotland and the Falkland Islands. After completion of the Air Defence Qualified Weapons Instructor Course, he was posted to No. 5(AC) Sqn, then to No 56 Sqn, the Tornado F3 OTU. In 1999, Attridge assumed Exchange Officer duties with the United States Marine Corps on Fixed-Wing Marine Fighter Attack Squadron. He flew the F/A-18 Hornet, held the position of Ops Officer and became day and night Aircraft Carrier Qualified, flying from the USS Abraham Lincoln and John C Stennis. Group Captain Jez AttridgeHe attended the Advanced Command and Staff College in Canberra, Australia, in 2008. On completion he assumed command of No XI Squadron. During his tenure the unit deployed at short notice in support of Operation ODYSSEY DAWN and remained in theatre for the first 3 months of Operation ELLAMY. His next role was as the principle staff officer responsible for Typhoon future capability, a position he held during the transition of Air Capability from MoD Main Building to HQ Air, RAF High Wycombe.